Malone Presbyterian Church Halls were the location for Downshire's annual summer concert on 25th June 2018 featuring our Junior, Youth and Senior Bands. The three bands performed an entertaining programme of 14 pieces including four new arrangements by Roger Doherty for the Junior Band and works new to the Youth Band including "Prismatic Light" and a selection of pieces from the movie "Happy Feet". The senior bands pieces included the trombone trio "Blue Moon", "Penny Lane" and the "Music from the Incredibles". The performances offered by the junior and youth bands in particular were outstanding and our youth team have been overwhelmed by the positive and encouraging comments from parents and other audience members alike. Our Chairperson, Paul Kirk thanked Downshire’s enthusiastic youth team for giving of their time freely throughout the year and also thanked parents for their support in sending their children to band each Monday night. 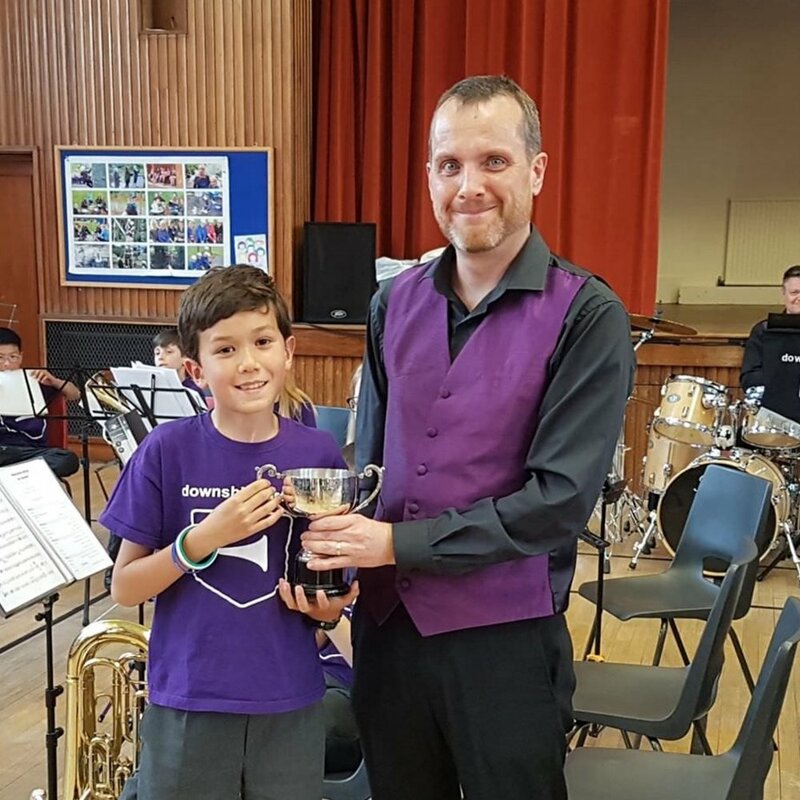 He commented on how the junior and youth groups had developed rapidly over the course of the year and that they were a credit to the local brass music scene. A highlight of this annual event is the award of trophies to young players in the junior and youth bands. With such a strong level of performance and commitment from our young musicians, it is always a challenge to identify the recipients. After much deliberation, it was agreed that the Sam Doherty Cup for Musical Endeavour should go to Jonathan Gillespie and the Doreen Alcorn Cup for Outstanding Musical Contribution should be awarded to Harrison Kirk. Congratulations both! Downshire Brass will now be taking a break for a few weeks before launching into the rest of our summer concert and engagements then onwards to the forthcoming contest season.